When you are diagnosed with lung cancer, you learn pretty quickly that a team of specialists rather than a single physician will manage your care. 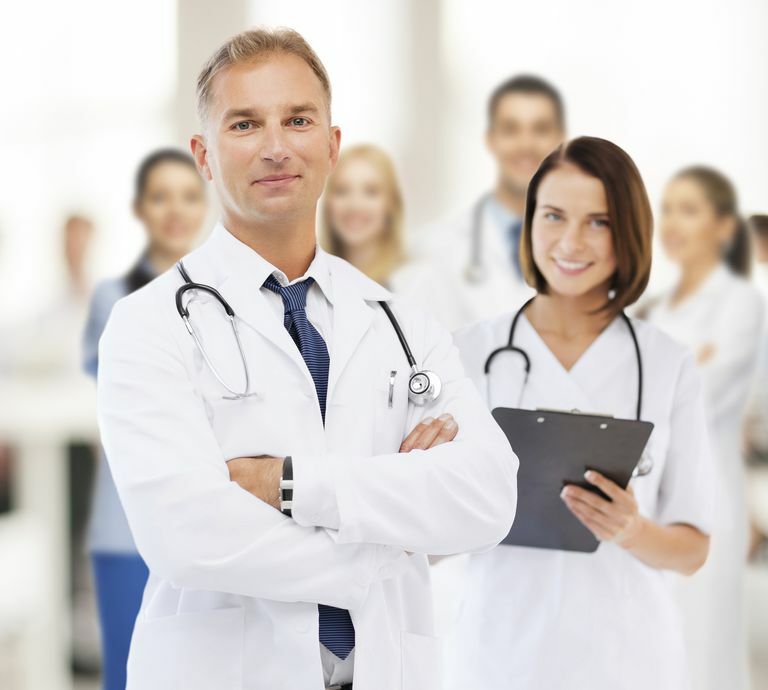 If you are used to your family doctor, this influx of medical people can seem overwhelming. At the same time, you might feel uncertain about who you should call if you have questions, or in the case of an emergency. Let’s begin with an overview of some of the members of a typical lung cancer care team, followed by questions and further information to help you know where to begin. Your primary care physician may be a family physician, an internal medicine specialist (internist), or a nurse practitioner or physician assistant. You may have known her for years, and she may be the one who ultimately diagnosed your lung cancer. But since primary care physicians rarely perform lung cancer surgery or prescribe chemotherapy, she will likely refer you to a medical oncologist. You may also choose a medical oncologist based on advice from family and friends, or your own research on cancer specialists. Primary care physicians (PMDs) are involved to different degrees after diagnosis depending on your specific physician; some PMD’s prefer to be very involved in your care, whereas others are more comfortable deferring major decisions (and minor decisions) to your oncology team. Regardless of how involved your PMD is during your active treatment care, it is important to keep her abreast of your progress so she is up to speed when you return to her care. A medical oncologist is a physician who specializes in treating cancer through the use of drugs such as chemotherapy and hormonal therapies. Most of the time your medical oncologist acts as the coordinator of your care with other specialists helps put together your initial treatment plan and helps to manage the side effects of your treatments. She will also continue to follow you at certain intervals following completion of your treatment to monitor for any evidence of recurrence, and to make suggestions for other therapies if needed for physical rehabilitation, mental health services, or nutrition counseling. Many cancer centers now have oncology nurse navigators who help coordinate your care during those anxious first days following a diagnosis. Roughly half of the people with lung cancer receive radiation therapy at some point during the course of their disease. Radiation therapy is given by a special radiologist called a radiation oncologist who treats cancer with radiation therapy. You may hear of terms such as “cyberknife” treatments if you have recently been diagnosed. These are actually not surgical treatments, but a special form of radiation therapy. Radiation may be given with a curative approach, or palliative — designed to help with the symptoms of lung cancer but without an attempt at curing the disease. Many people diagnosed with lung cancer will also see a pulmonologist, and it’s not uncommon for lung cancer to be diagnosed by these specialists. A pulmonologist is a lung specialist who treats lung diseases including lung cancer. Since lung diseases such as COPD often exist along with lung cancer, and because lung cancer surgery can reduce lung function, a lung specialist is often included as part of your lung cancer team. You may not see your pathologist face-to-face, but these are the physicians in the lab who will examine tissue taken from a lung biopsy or lung cancer surgery. In addition to being responsible for determining the type of lung cancer you have, the role of the pathologist is becoming increasingly important in personalizing management of lung cancer. Part of the role of the pathologist is determining mutations in the cancer cells that are unique to you – and can, in turn, suggest which medications will work best for your particular cancer. Some people are shocked when they are told a consult with a palliative care physician is recommended. It’s important to note that palliative care is not the same as hospice. Palliative care is a type of care that is offered for people who are having curative therapy for their cancer, not just those with incurable cancers. A fairly recent finding has been that people with lung cancer who receive palliative care consultation not only receive the benefits of this form of treatment but survived longer than those without access to a palliative care team. For those who are unfamiliar with palliative care, this approach is usually undertaken by a team instead of a single physician. The goal is to treat the symptoms of cancer, the side effects of treatment, as well as the emotional and spiritual aspects of a cancer diagnosis. As such the team usually includes a combination of physicians, nurses, social workers, and other specialists who can maximize your well-being during and after cancer treatment. It may sound overwhelming to include even more specialists on this already long list, but it’s important to bring up the role of specialists that may be recommended during the course of your treatment, and often after your initial cancer treatments are completed. Just as people often require rehabilitative services after a heart attack, a stroke, or a knee replacement, we’re learning more and more that some of these services can help cancer survivors return to the best quality of life possible after treatment. Respiratory therapists may be consulted to perform pulmonary rehabilitation if you’ve lost a lung or part of a lung from surgery. Another type of physician called a physical medicine and rehabilitation specialist (physiatrist) may work to help you find therapists to overcome physical limitations that came about because of your cancer treatments. People with lung cancer often experience both anxiety and depression. Your oncologist may recommend that you see a psychiatrist or a psychologist help you cope with your diagnosis and the emotions that go along with the treatments for cancer. The oncology nurses you meet will play an invaluable role in your care and throughout your cancer treatment. Ask questions and let these compassionate caregivers assist you. It’s often the nurses who hear about questions others have forgotten to ask, and concerns that are common among those newly diagnosed. Take advantage of their excellent knowledge. Who should I call first if I have any concerns? Who should I call if it is after hours or on weekends? Who will be managing my medications (other than chemotherapy), such as medications for breathing and pain medications? What role will my primary care doctor have in my treatment? You may wish to talk to your PMD after you have your initial treatment plan and ask what degree of care he will be comfortable providing. How will my primary care doctor be kept updated with my care? Lung cancer is expensive. Thankfully some generous people have worked together to help ease a tad of the discomfort during those first days and months of treatment. No matter where you live, services such as free housekeeping during chemo, wigs and scarves, pillows for when you need to cough after surgery, and even retreats to be pampered are free for the asking.